I recently helped to run a Transition Town renewable energy day in Totnes along with Fair Energy and some others. I was explaining the use and installation of wood boiler stoves, and Finian from Good Energy explained the use of solar thermal, and solar water tanks. Wood boilers and solar thermal are the perfect companions, like two well suited house mates: solar thermal works in the summer and sleeps in the winter, the wood boiler sleeps in the summer and works in the winter, and for a brief transition period they get to actually see each other and have breakfast together in autumn and spring. 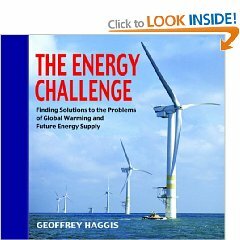 The Energy Challenge is a thinking person's book, an unbiased look at the various methods at our disposal of reducing global warming while still keeping the lights on. Geoffrey Haggis takes a very reasoned look at the challenges we face and some of the solutions to them, for which he gives the case for and against in a very matter of fact manner. What his writing lacks is self righteous sanctimony: this is not another global warming book that tells you what your ethics should be. Neither is the book 'wishy-washy' - he explains each concept from the ground up without getting overly technical, useful facts and figures are worked into the text, very well referenced throughout. In fact the clear and reasoned way in which he explains concepts makers me think that he has an academic background, I'll just check....... Yep, at the front of the book it tells me that he went to Trinity (Cambridge) and studied Maths and Physics, wrote a Ph.D. on the structure of water within the living cell, went on to be senior lecturer at the Physiology Dept. at Edinburgh Medical School wrote books, did research and teaching at a string of international institutions, before sensibly retiring to one of the best places in the UK: Devon. Geoffrey covers various solutions often associated with the 'alternative' movement (do bear in mind that the idea of plate tectonics was still 'alternative' less than 100 years ago), but I get the impression that he went back to basics using reason to come up with the solutions rather than taking them as truths. This is another thing which I like about the book - the solutions are presented because they make sense. In terms of substance he is coming up with a similar menu to some 'alternative' movements, but for me it is much more appetising. The pages are not just dense text so you are not overwhelmed. There is a nice wide inner margin in which there are bite-size facts and interesting supplementary comments. The only thing which lets the book down is the quality of the images. Some appear badly scanned and/or a little dated. But that is a minor point - you are reading this book for the content not the pictures. If you were just starting out then you might perhaps start with "The Hot Topic" by Sir David King, and then move on to The Energy Challenge which goes a bit more in depth.